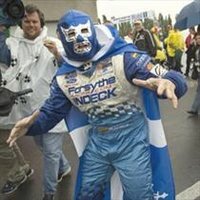 Good news for Paul Tracy fans, as he continues progressing towards becoming a fulltime IndyCar driver by the time he's 50. KV Racing Technology will field a car for open-wheel superstar Paul Tracy at the two Canadian races on the 2009 IndyCar Series schedule. Tracy, the 2003 Champ Car World Series champion, is one of the most successful and exciting drivers in the history of open-wheel racing. The a native of Scarborough, Ontario, Canada, will compete at the Honda Indy Toronto on July 12 and the Rexall Edmonton Indy on July 26. Sadly Tracy's press conference was cut short when reporters discovered that this very morning Helio Castroneves had saved a cat caught in a tree, formed a foundation for dyslexic children, and began dating Jennifer Aniston. A Big "Yay!" from over here on the west coast! Paul's presence in the series can only help it...the sooner he gets back to a full-time ride (no, not Jennifer Anniston) the more credibility the series gains as far as depth of talent. Drivers of his caliber make winning races in a series mean something. Get Bruno, Oriol, Will Power, Buddy Rice...even get Seabass back over here...in decent equipment along with the current 'big dogs' of the series , and you got yourself a serious world-class bunch of races again.